I’ve always had something of a soft spot for the Fable games. I used to think I had this view in spite of myself, that the Fables somehow bypassed my quality control despite being objectively fairly bad. However, after playing some monumentally awful games this year I’ve had an epiphany: the Fable series is actually exceptionally well made when compared to other games which try the same thing. In particular Overlord tries to do the comedy fantasy RPG thing and falls flat on its face over and over again, and it ends up making the player hate it. Fable III on the other hand was moderately amusing at regular enough intervals that I didn’t begrudge it the attempt at all. Largely this is down to the huge amount of voice acting in the game – in fact there’s actually very little text at all – which is a welcome relief from the RPG paradigm of voicing only conversations with the main character and having anything else be an email on a computer or something. For example, picking up a book in Fable III won’t bring up the usual text box with scrolling sidebar. Instead a disembodied voice will read out what the book is about, usually in the most sarcastic manner possible. This does wonders for the game’s humour because it allows parody in delivery as well as content; the Choose Your Own Adventure gamebook managed the rare feat of dragging an audible chuckle from my lips, which almost never happens in games. Not intentionally, anyway. So Fable III manages the remarkable feat of actually being funny on occasion, which is good because otherwise – one thing aside, which I’ll get on to talking about later – it’s remarkably unremarkable. Have you ever played one of the previous Fable games? Fable III is that, only dumbed down even more. It’s fascinating to watch the devolution of the series from an initial state whose RPG element was already dangerously thin. You’ve got the dog, check. The omnipresent glowing trail telling you where you should go next so that you never have to think, check. Z-targeting has been replaced with auto-aim, which ensures combat devolves into mashing one button over and over with – again – very little thought put into it whatsoever. There’s now only one type of experience orb which is collected automatically, but that’s okay because there’s no real skill progression any more. Instead I had to save up my experience until the game said “Okay, you’ve progressed far enough to unlock the next tier of skill upgrades!” at which point I bought them all because I had experience points coming out of my ears. In other words the only “progression” in this game is dictated by the plot, which basically means it’s no longer even pretending to be an RPG. And finally we’ve gone from the dozen or so weapon types available in Fable II to just four in Fable III – these weapons automatically upgrade themselves so the thrill of finding a legendary is very much muted, since it won’t be that much better than your stock weapon. All that’s left in the lineup is a rifle, a pistol, a sword and a hammer. The hammer. Let me tell you about the hammer. If you asked me what the outright bloodiest, most violent game I’ve played this year was, I’d answer “Dead Island”. However, Fable III is close behind it in second place, and it’s mostly down to that damn hammer. I’m not sure why when there’s nothing in it even remotely comparable to DI’s enthusiastic dismemberment. Maybe it’s because of the setting – -it’s more than a little odd going from a cutesy cartoon stroll through lush green countryside to smashing someone’s knee the wrong way in slow motion before burying the hammer in their skull, all in the space of a few seconds. 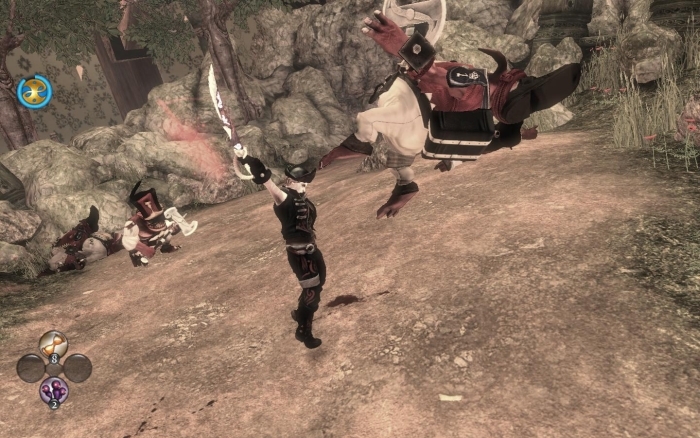 I enjoyed the hammer very much; few games manage to properly communicate the horrifying trauma a blunt weapon can inflict, but Fable III manages it. This unexpected pleasure aside, there’s little that’s challenging about the combat. In fairness, I don’t think I’d want there to be; that’s not what I play Fable for. But that’s no excuse for this mass dumbing down of everything in the game that requires player interaction. Most of all the morality system. Now, Fable’s morality system has always been rather superficial, rather like choosing to dye your clothes red rather than blue. The only real nod the previous games gave it were a few weapons and sidequests. However, this was better than Fable III, which is the first game I’ve played where there is absolutely no difference between being good and being evil. Doesn’t change the loot, doesn’t change the dialogue, doesn’t change the plot. All it changes is your appearance. And I thought this was a spectacularly awful design decision, especially in light of what Fable III tries to pull off in the latter third of the game. Fable III is a game with an idea, you see. As ideas go, it’s actually pretty good. The general storyline of the game was that I was Prince/Princess who was trying to start a revolution to seize the throne from their insane brother. So I went around doing quests to secure allies and all that jazz, and then I actually had the revolution, and I became King/Queen. This is the point where 99% of RPGs would call it a job well done and roll credits, but Fable III keeps going. There’s an ancient evil encroaching on the kingdom, and I had a year to prepare for the invasion. I had to make a series of choices to either keep promises I made to certain people during the revolution (good), or break them in order to raise money to fight the coming darkness (evil). This is hardly an original idea – it’s been done before in NWN2 at the very least – but Fable III was the last place I was expecting to see that sort of innovative gameplay concept rear its malformed head. Unfortunately the ridiculous amount of “streamlining” that’s gone on in every other aspect of the game completely sabotages what this part of the game is trying to do. The problems are as follows. 1) It assumes I actually give two shits about the promises I made to the two-dimensional characters who supported my rise to the throne. 2) It does nothing to provide me with any connection to the kingdom; the projected casualty rate is simply number of citizens minus amount of money stockpiled, while towns on the map remain resolutely unswallowed by a Lovecraftian evil that’s apparently polite enough to wait until I’m ready to fight it. 3) There’s no drawback to making good or bad decisions; morality is so inconsequential that I don’t really care about flipping from evil to good or vice versa through making these decisions. 4) Point three is exacerbated by the fact that it’s possible to have your cake and eat it too by donating money from your own hoard to the kingdom treasury. Trouble is, anyone who has taken even the slightest bit of interest in dabbling in real estate will have more than enough money to pay for the entire invasion while making all the decisions which hit the kingdom treasury the hardest. So the game’s one big idea crashes and burns thanks to the above robbing the choices I made of any sort of wider ramifications for either my character or the world. I may as well be flipping a coin for all the consequences they had in the end. Which sums up Fable III pretty well, really; it’s not even close to being an RPG any more, having far more in common with the light-and-fluffy sandbox nature of the Sims than it does even the limited role-playing of a Bioware game. Within this narrow scope it’s kind of fun, in a braindead sort of way, but there’s only so many times I can fart in a villager’s face before I have to stop myself and wonder what the hell I am doing here. The first fable had its thing, I remember waiting for the sequel eagerly just to find myself not being able to play them in pc (as will always be my way of playing good, long and enjoyable games). Years have passed and i still remember the potential the first chapter had. Shame on their imagination for not being able to work it out.